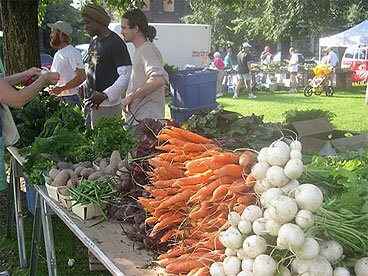 Modern farmers markets buck the trend towards scale. The vendors are small farmers and food producers who can not produce food as cheaply as factory farmers but by selling directly to the public they can compete on price. It is best to eat food that is local, fresh, seasonal and organic. Apart from growing your own there is probably no better way to get food like this than at a farmers market. A farmers’ market is a food market where local growers, farmers and artisan food producers sell their wares directly to consumers. Vendors may only sell what they grow, farm, pickle, preserve, bake, smoke or catch themselves from within a defined local area. The market takes place at a public location on a regular basis. The individual stalls at the markets are run by the farmers themselves and therefore provide an opportunity for you to find out more about what you are buying and how it is grown. Because there is no middle man the prices are usually good value and all the money goes directly to the farmer.